Mr Green’s Final Halloween Races! Compete for the last €7K in cash, Free Spins and more tickets to the final draw! The Halloween party at Mr Green is in full swing. Make sure to race your fellow players for a share of the final €7,000 in cash. And do not forget to complete enough spins to collect your ticket for the Pumpkin Smash Draw where one winner will win a Halloween-themed getaway to Long Beach, California and stay in B340, the most haunted suite on the Queen Mary. Plus, a further 49 runners-up will spook their accounts with a share of €10,000. 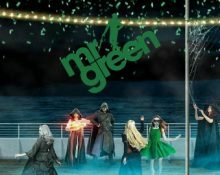 The “Greentober Fest” at Mr Green has just ended and we are straight onto the next marathon party, running until 1st November 2018. The Halloween Promotion will see hundreds of lucky winners taking home free spins and cash prizes, while one very lucky player will win a ghostly getaway to Long Beach, California. Terms and conditions apply. Throughout every week in October, Mr Green will hold a number of races on selected slots. They are either spin count, mission or wager races. The games selection is changing for every tournament. The TOP50 scoring players will win cash prizes ranging from €25 – €1,000, credited with no wagering requirements within 72 hours after the race has ended. Play with minimum €0.20 cash bets on Dark Vortex and score the highest coin win in a single spin to win a share of €3,000 in cash. The TOP40 players on the leader board will win cash prizes from €25 – €750, credited with no wagering requirements within 72 hours after the race has ended. Collect one ticket to the prize draw for every 200 rounds with cash bets on the active tournament games. Amount of tickets per player is not limited but only one prize can be won per player. A total of 50 winning tickets will be drawn live on 2nd November 2018 at 19:00 CEST on the Evolution Blackjack Table 1 and the prizes allocated in order they are drawn. The Long Beach California Travel Prize Package is exchangeable for an 80% cash equivalent. Main Prize – Long Beach California Travel Prize Package, worth €15,000 and includes return flights for two from Europe to Los Angeles, private airport return transfers, two nights’ accommodation in the B340 Suite, the most haunted room on The Queen Mary, breakfast each morning, ghost tour of the ship for two, 3-course dinner with wine the ship’s fine dining restaurant, 60-minute haunted escape room for two, Mr Green trick or treat candy in room on arrival, 5 nights’ additional accommodation at a 5* hotel in L.A. including breakfast, private transfers from the Queen Mary to the hotel, €2,000 spending money and comprehensive travel insurance for two. Runners-Up Prizes: 1x – €3,000 | 1x – €2,000 | 1x – €1,000 | 1x – €500 | 4x – €200 | 10x – €100 | 30x – €50, credited with no wagering requirements within 72 hours after the draw.